The many products available for sale and the various features they offer might burden your search of the best cordless phones for seniors. To simplify your shopping and help you get one step closer to the product that best suits your needs, we have examined some of the top-rated products on the market and concluded that the Panasonic KX-TGF350N is the first option to consider. The product was designed to make call management easy and quick and, thus, features a smart, easy-to-use design. Besides the user-friendly menu and large buttons and digits for easy reading, the phone has a 3.4-inch high-contrast LCD that allows various adjustments for an optimized performance. It provides up to 13 hours of talk time and offers additional features such as noise reduction. If this product is no longer available, you might want to check the AT&T CRL32102 as a reliable alternative in terms of quality. Designed with seniors in mind, this cordless phone will help your grandparents easily stay in touch with you. Featuring large buttons and digits as well as a high-contrast LCD, the phone can be used in all light conditions and even by people with weak eyesight. The noise-reduction feature will help you enjoy high-quality calls. Moreover, the handset will audibly let you know about the name of the caller. It offers up to 13 hours of talk time. Voices are unclear when the speaker is on, according to at least one buyer. Help your senior make and receive calls with this easy-to-use cordless phone. Ease of use, reading, and dialing even in low-light conditions are the benefits you get to enjoy with this phone. Ideal for visually impaired people, the unit uses the Audio Assist technology to improve sound quality and help seniors understand speech better. You can use the phone for listening and speaking without holding the handset. It offers 14 minutes of digital recording and it announces the caller ID. The menu is available in three languages. The red lights proved to be too bright in the case of one customer who tried it. Take your calling experience to the next level with this easy-to-use cordless phone. If you want your new phone to provide you with enhanced visibility, ease of use, and increased sound clarity, this unit should not be ignored. Designed with such advantages in mind, the item comes with a built-in answering machine, a big backlit monochrome screen, and an extra-large keypad. The product promises to provide both sonic and visual clarity. The various settings featured will help you maximize the sound clarity according to your hearing needs. The phone proved to be not loud enough at least for one buyer who tried this model. Give this phone a try if you want to enjoy enhanced sound clarity and ease of use. Finding good cordless phones for seniors might not be that easy, given the various models the market offers these days. To ease your decision-making process, we have chosen the products that come with some of the most important features and compiled a list of reviews of cordless phones for seniors. 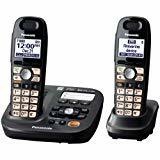 Whether you’re looking for cordless phones for yourself or for your dear ones, this model from Panasonic is what we think should come first on your list of options. The product has what it needs to make a good cordless phone for seniors. It can, thus, be considered when looking for useful grandma gifts or a few cool gifts for grandparents. Boasting an easy-to-use design, the phone sports large buttons and digits as well as a high-contrast LCD that can be adjusted to work in all light conditions and even help people with weak eyesight. The quality of your calls is ensured by the noise-reduction feature. The three one-touch dial pads will make it easy to stay in touch with your favorite callers. Plus, the handset will let you know who’s calling you by announcing the name of the caller. The phone provides up to 13 hours of talk time. Ease of use was the thing the engineers behind this phone had in mind when creating it. It thus sports a high-contrast LCD that allows easy reading as well as convenient dialing in low-light conditions and enlarged font and large backlit keys that increase the ease of use. It is ideal for visually impaired people. The CRL32102 Handset Landline Telephone uses the Audio Assist technology to temporarily increase volume and enhance sound frequencies to help seniors understand speech better and with greater ease. You can even choose one of the four preset audio profiles or customize the bass, treble, and tone to match your hearing needs by using the equalizer. The design allows you to listen or speak without holding the handset. Moreover, the base and handset will announce the caller ID. It also provides 14 minutes of digital recording and a quick access key for voicemail box. The setup menu is available in English, Spanish, and French. Another option you might want to bear in mind is this model from Panasonic if ease of use, enhanced visibility, and increased sound clarity are the specs you want from your cordless phone. This phone that’s compatible with many hearing aid models comes with a built-in answering machine, an extra-large keypad as well as a big backlit monochrome screen to improve your senior’s experience. The 1.9″ (103 x 65 pixels) monochrome display will show the numbers you dial or the caller ID clearly. It is ideal for people with less than perfect eyesight. Clarity when using the phone does not target only the visual part but also the sonic side of it. Thus, the phone comes with a tone equalizer to enable you to control bass, mid-range and treble tone. This way, sound clarity is maximized and adjusted to the user’s hearing needs. The high-quality speakerphone will make sure you enjoy enhanced voice clarity when using the hands-free option, too. 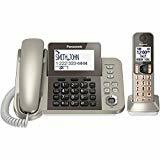 Designed with a senior’s needs in mind, this cordless phone from Panasonic is another model that shouldn’t go unchecked before pushing the order button. The large keys ensure easy dialing whereas the Enhanced Noise Reduction feature will help you enjoy a clear sound even in places where silence is not an option. Moreover, the phone won’t just enhance a senior’s experience when speaking or listening but it will also help users find lost things. Thanks to the Key Detector that can be attached to things you usually or easily misplace such as your car key, you can quickly track down the lost items. You just need to activate the Key Detector’s beeping alarm by using any of the phone handsets. This feature can find objects up to 200 yards away. Plus, the powerful battery backup system will keep you connected even when the power goes out. The 1.8-inch LCD screen ensures easy and clear reading. Another product that makes dialing and reviewing call history easy is the Dect 6.0 model from Northwestern Bell. 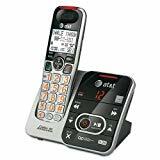 Specifically designed for seniors and people with limited dexterity and poor eyesight, this phone sports big backlit buttons and large fonts so the user can find and dial the desired number with ease. Furthermore, the Braille augmented keypad renders it ideal not only for individuals with low vision but also for blind people. The digital, LCD caller ID screen allows sighted people to see who’s calling before they answer. The product also comes with a 50-number phonebook memory. The cordless design will enable users to have freedom of motion when enjoying their chats. What’s more, this model includes a visual ring indicator as well as easy-to-use controls. Exploring and using the menu are also free of any complicated steps. Customers who’ve tried it have appreciated the phone for its overall performance as well as for eliminating wireless and electronic interference. Boosted sound clarity and ease of use are the benefits you get to enjoy when using this phone from Clarity. Created especially for people with moderate hearing, this model includes the E814 amplified corded phone and the D703HS amplified cordless handset to cover various needs. Amplifying incoming sounds up to 40 decibels, the phone also gives you the possibility to personalize your experience according to your listening needs thanks to the four tone settings. The speakerphone is committed to providing you with the volume and sound clarity you need to enjoy flawless hands-free conversations. The big keypad, high-contrast numbers, and the display featured ensure great visibility. You also get 10 ringer melodies and 6 volume levels to choose from. The hearing aid compatible phone includes an amplified digital answering machine and comes with 5-speed dial buttons that will allow you to store important numbers. If you want to help your grandparent enjoy clearer chats with you and you’re looking for quality great granddad gifts, one option you might want to consider is this Clarity phone as it was built especially for seniors in need of a user-friendly phone and high-quality sound. Enhanced visibility is ensured by the large backlit buttons and big fonts. The display also offers just the right contrast for the information you see to be clear and easy to read. The 30dB of Clarity Power amplification and the adjustable tone control are committed to delivering a better sound experience. The item is hearing aid-compatible and comes with a belt clip and a 2.5mm headset jack. The customers who’ve purchased it have given positive feedback appreciating the overall quality, easy-to-read buttons as well as the high-quality sound when used even in loud places. Designed for people with mild to moderate hearing loss as well as weak eyesight, this cordless phone is another product you might want to check before placing your order. The engineers behind it wanted to provide seniors with a phone that is easy to use and that can provide a high-quality sound. Therefore, the item features large backlit buttons with big numbers so you can easily and quickly see the keys you’re interested in. It is thus great even when using it in low-light conditions. The DECT 6.0 technology eliminates interferences so you can enjoy a superior experience. The product delivers 40dB amplification and increases sound up to 90 times. Furthermore, the Talking Caller ID will announce the caller’s number so you can choose if you want to answer or not. What’s also great about this model is that all keys “talk back” in clear voice in order to confirm if you’ve pressed the key you were interested in. Many of us seem to be hanging up landlines and using mobile phones for calls instead yet having a home phone still comes with some unbeatable advantages especially if you’re on the senior side. Even if you’ve already bought a senior cellphone, you might want to ensure your grandparents or parents enjoy the security and the great performance home phones offer, too. When looking for a cordless phone for the elderly, there are various features you need to consider in order to get a product that will simplify your senior’s experience and improve his or her life. Here are the main specs you should use to guide your shopping and help you make an informed decision. The fewer buttons and options, the better. That’s how it usually works with seniors. Well, if you still want to go for a cordless phone that comes with the classic buttons, make sure they are large enough for the senior to use and see with ease. People with arthritis might find it difficult to push small buttons. You might want to consider a model that sports large backlit keys to help even individuals with low vision and allow them to use it in darker places as well. The fonts must be large, too. This way, the user will quickly find the desired keys. More often than not, seniors will need a phone that can amplify the incoming sound as old age might also include hearing problems. Use this feature as a guide to filter the many products available on the market these days. Pay attention to the ringer sound and the receiver volume. As far as the first one is concerned, it is best to go for a phone that rings with a loud, repeating sound. Many products replicate the bell sound of old phones, which proves to be a feature many seniors like. Also, make sure the ringer volume can be adjusted to the user’s preferences and needs. Some seniors might have trouble understanding clearly what the caller says. Here’s where the volume amplification the phone offers comes into sight. There are models that will automatically amplify the receiver volume and then there are products that will allow you to adjust it manually. Look for a model that adds 30, 40, and even 50 dB to the conversation. Since seniors have greater risks of experiencing health problems, many phones for them feature visible emergency calls, and it is best to go for one that does so. This button can prove to be a life-saver. Many such buttons are preprogrammed to call 911 but you can also find products that give you the possibility to program this button to call a family member instead. The emergency calls are usually bright red and can be easily located. Keep this factor in mind when looking for such a product. This simple button can make the whole difference in certain cases. You will often hear seniors saying they hear calls better when they use the speakerphone. This feature uses a speaker outside of the receiver to render the incoming call. Since it plays the phone call externally, the volume will obviously be higher than when listening only through the receiver. It is best to ask your senior if such an option is a must and act accordingly. You might also check a model that includes an answering machine in case your senior wants one. Some models boast full controls that are built into the base whereas others will allow access via the handset. A phone whose base unit records and stores the messages is usually preferred yet the size of the unit will be larger. Don’t forget about the recording capacity. Most cheap cordless phones for seniors will provide you with 10 minutes whereas more expensive phones can record up to an hour of messages. Given the many unnecessary calls we can get these days, a phone that allows the user to see who is calling and even block certain numbers can prove to be a feature your senior will thank you for. Many phones boast call-blocking features and some of them will even let you block 250 unwanted phone numbers. The Caller ID display will announce you the number of the caller so you can know before answering. Sophisticated call blocking phones can even act as a virtual secretary and ask the callers to leave their name before it actually asks you whether you want to take the call. Such phones might prove to be highly appreciated gifts for seniors or even cool gifts for retired teachers. Also, consider how many speed-dial numbers you can store. Some phones will let you access the numbers you dial most often by simply pressing a single button. This can be a very useful feature for seniors who want to keep it simple. Yes, this is an option seniors with weak eyesight will find quite useful. Today’s market offers various cordless phones that talk back. This feature regards different aspects. You will find phones that will let the user know about the caller ID by announcing it out loud. Then, there are phones that will say out loud the number or function of the button you’ve pressed and thus confirm if it’s the one you were interested in. This will reduce errors and improve the senior’s overall experience significantly. Last but not least, the range the cordless phone is capable of counts a lot. You most probably want to walk around the house or office without worrying that your call could get disconnected. That’s why it is recommended to go for a DECT 6.0 phone. Most such phones provide a 164-foot indoor range and a 984-foot outdoor range. Even if you get a product that states such ranges, keep in mind that the various objects in your home and the walls will add significant attenuation to the signal. To overcome this problem, though, you can use a DECT repeater.